Justice Ganguly asks “what action has been taken by SC on an affidavit by a senior advocate alleging that several of Chief Justices’ were corrupt”? Justice A.K. Ganguly yesterday raised the question ““what action has been taken by SC on an affidavit by a senior advocate alleging that several of Chief Justices were corrupt”? He was speaking to Rajdeep Sardesai on CNN IBN. Do you feel that you have led down by your own fraternity in a sense? I feel that I have been treated very badly by the Supreme Court. Unfairly treated by the Supreme Court. Treated without jurisdiction and authority. This is unprecedented. Why exception in my case? I don’t want to say further. Why? Tell us why it is happened? Why was an exception made? I don’t know. It is for the nation to understand. But hasn’t this happened for the first time that a charge of this nature is being made against a former Supreme Court judge which has come out in public? Again you are using the word charge. No, this is not the first time. If my memory is correct, there is an affidavit by a very senior lawyer of Supreme Court saying that several of chief justices were corrupt. What did the Supreme Court do? You are saying that Supreme Court has not stood against judicial corruption? But the Supreme Court has taken you in an unfair manner? No, no. What did the Supreme Court do when a very senior lawyer of Supreme Court filed an affidavit before the Supreme Court? Did the Supreme Court disclose their names? Was it judges, or Chief Justices? I have nothing to say. It was in September 2010 that Prasant Bhushan had said in an interview to Tehelka that “out of the last 16 to 17 Chief Justices, half have been corrupt”. 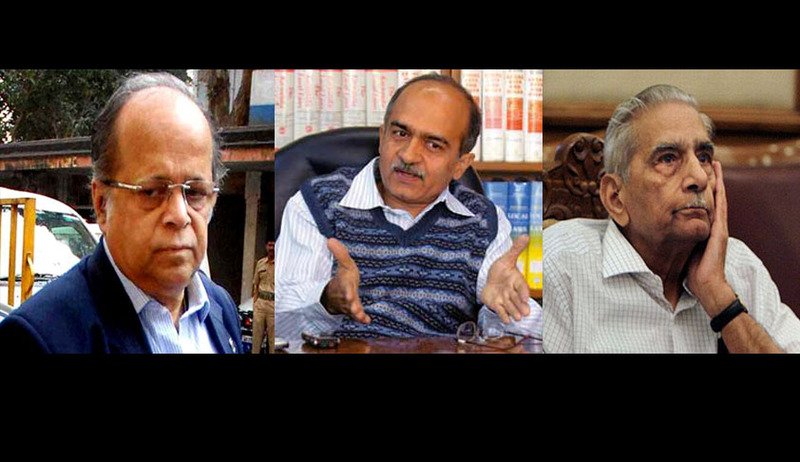 A Bench of three Judges, headed by Justice Altamas Kabir, took suo motu contempt case against Mr. Prashant Bhushan for his interview. It was in this contempt proceeding that a senior lawyer and a former Law Minister of India filed an affidavit supporting his son Prasant Bhushan. According to an Outlook report Senior Advocate Mr Shanti Bhushan backed his son's statement by affirming in his affidavit that out of the last 16 Chief Justices at the time of the impugned interview, “in the applicant’s opinion, eight were definitely corrupt, six were definitely honest and about the remaining two, a definite opinion cannot be expressed whether they were honest or corrupt. The signed lists identifying these eight, six and two Chief Justices of India are being enclosed in a sealed cover which is being annexed hereto as Annexure B." “...since the applicant is publicly stating that out of the last sixteen Chief Justices of India, eight of them were definitely corrupt, the applicant also needs to be added as a respondent to this contempt petition so that he is also suitably punished for this contempt. The applicant would consider it a great honour to spend time in jail for making an effort to get for the people of India an honest and clean judiciary. The affidavit by Mr Shanti Bhushan furthers the debate on judicial accountability, and it thus becomes necessary to be read in full. Meanwhile according an ET report “Justice Gnaguly flew from Ahmedabad to Delhi on an aircraft hired by a company which is an accused in the 2G spectrum and licence allocation case. The plane was hired by Majestic Infracon Private Limited, one of the owners of Etisalat DB, a now-defunct telecom company whose licences were cancelled by a Supreme Court Bench consisting of Justices Ganguly and GS Singhvi in February 2012. Majestic Infracon is owned by Pony Infrastructure, which in turn is owned by Shahid Balwa and Vinod Goenka, the promoters of DB Realty”.